"Jack, I&apos;m going to Sam&apos;s!" I yelled at my brother. "I&apos;m coming with you!" He yelled back as he ran after me. "Friendly reminder, I&apos;m also Sam&apos;s best friend." He raised his brows. I totally forgot about that. Sam and I have been dating for a couple of weeks now, and surprisingly, J was sort of okay with it. "Alright. You&apos;re driving, though." I told him. He grabbed his keys and we walked out of the door to drive to Sam&apos;s house. "Hey babe! Johnson!" Sam said as he opened the door. He hugged me and bro-hugged Jack. We walked into his house and saw Nate sitting there. We greeted each other and sat on the couch. Sam walked over to me to sit next to me but Jack was faster and quickly sat next to me and threw an arm around me. Sam gave Jack weird looks before sitting down on the other couch. He saw us together before, but that was apparently different for him. We caught up, talked, laughed. Jack was still next to me, but I wanted to sit next to Sam. So I stood up and sat next to Sam. "What&apos;s up, Y/N?" Sam said while kissing my cheek. Jack fakily coughed, making us look at him. "What do you want, Jack?" I asked annoyed. "I&apos;m preventing my best friend from kissing my sister." He said coughing even harder. 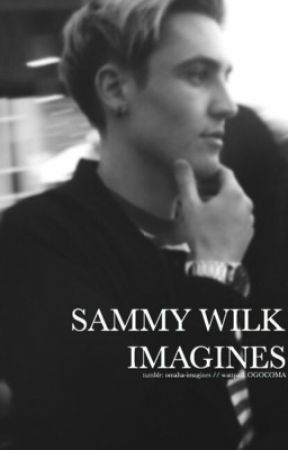 I let out a chuckle and looked at Sammy. Then back at Jack and back at Sammy. I kissed Sam while cupping his face. When I looked back at Jack, he looked pissed. I started laughing at him. "Oh, c&apos;mon Jack. You&apos;re being ridiculous." "You hurt my heart." He said while dramatically placing his hand on his heart. Eventually he let out a laugh. "Sorry Y/N, it&apos;s just a little weird to see this." "Get it used to it, buddy." Sam said as he leaned in again and kissed me.